The NEBNext® Fast DNA DNA Library Prep Set for Ion Torrent™ enables library preparation from pre-sheared DNA, with a streamlined, high-performance library prep workflow. If enzymatic shearing of DNA is preferred, a version of the kit that includes enzymatic fragmentation reagents is available. 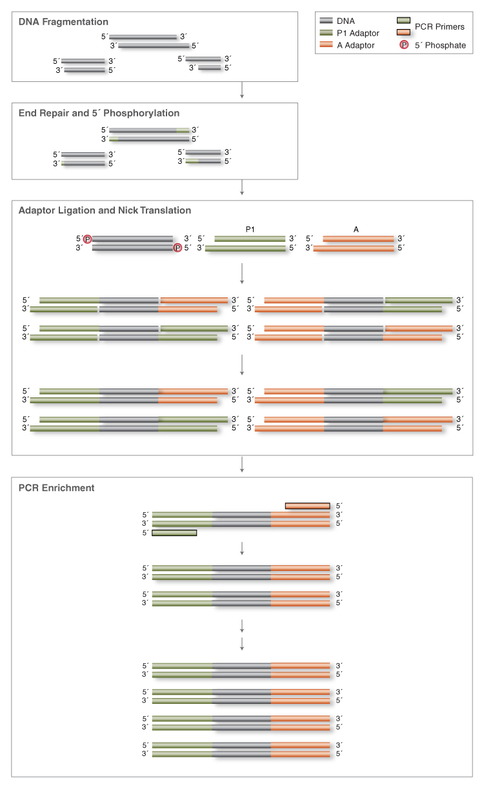 The NEBNext Fast DNA Library Prep Set for Ion Torrent is suitable when mechanical methods, such as Covaris® acoustic shearing, are preferred for fragmentation of input DNA. The components and protocol for this kit have been optimized for the volumes and concentrations of DNA sheared by mechanical methods, and the kit is compatible with input amounts from 10 ng - 1µg, with a workflow time of under 2 hours and ~12 min. hands-on time..
What type of starting material can be used with NEBNext® DNA Library Prep Set for Ion Torrent? How much starting material do I need to use when preparing libraries using the NEBNext Fast DNA Library Prep Set for Ion Torrent? Does the NEBNext DNA Library Prep Sets for Ion Torrent work well for GC-rich DNA and AT-rich DNA? Can I use the NEBNext DNA Library Prep Sets for Ion Torrent reagents for preparing RNA? What methods for reaction clean up can be used with Ion Torrent Library Preparation Kits? NEBNEXT®, NEW ENGLAND BIOLABS®, Q5® and WARMSTART® are registered trademarks of New England Biolabs, Inc.
BIOANALYZER® is registered trademark of Agilent Technologies, Inc.
ION XPRESS™, ION TORRENT™ and PGM™ are trademarks owned by Life Technologies, Inc.